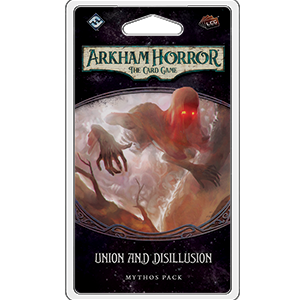 Union and Disillusion is the fourth Mythos Pack in The Circle Undone cycle for Arkham Horror: The Card Game. After your brush with the Silver Twilight Lodge in For the Greater Good, you journey to the banks of the Miskatonic River in search of the four souls who went missing from one of the Lodge’s events. Between two of the bridges that span the river, there stands the Unvisited Isle. The foggy shores are barren and unwelcoming, and as you row closer, you try to remain silent, as if to keep the river itself from noticing. Not a soul greets you as you draw closer to the island, save for the judging gaze of ghostly birds that observe you from the trees. In the distance, a pillar of spectral energy is rising into the clouds, a vortex of otherworldly mist spiraling about it. As you explore the island, you will find braziers scattered at various locations, that you can either light or douse with the new Circle action ability. Lighting these braziers may help push back the heavy mist, allowing you to further explore the island, but it may also be the key step in completing the ritual that has already begun. How far can you push Arkham to the brink of chaos without surrendering the city to the dark forces battling for control of it? This is not a standalone product. It requires a copy of the Arkham Horror: The Card Game Core Set and The Circle Undone deluxe expansion to play.